Lakeside’s Kamal Muhammad collected a silver and a bronze at the Class 7A State Swim Meet to help lead Lakeside to a third place finish. Solid performances by Kamal Muhammad and Sam Witcher at the Georgia Tech McCauley Aquatic Center pushed the Lakeside Vikings into a third place finish with 255 points in the Class 7A boys’ state swimming and diving meet recently. 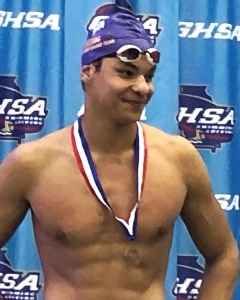 Muhammad swam to a pair of medals in the state finals taking a silver in the 100 freestyle (45.01) and bronze in the 50 freestyle (21.12). He also teamed with Gavin Wheeler, Mark Rotolo and Jack Hobbs to finish fourth in the 200 medley relay (1:34.74). 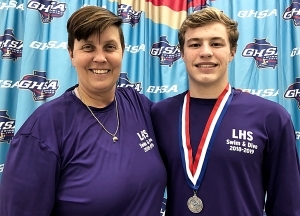 Witcher, the four-time and DeKalb County record holding diver, broke the former pool record in the one-meter diving in taking the silver medal with 675.15 points in the event. Muhammad, Wheeler and Hobbs came back to team with Matthew Bigham to finish fifth in the 200 freestyle relay (1:34.74). Zachary Zhao added a fourth place finish in the 500 freestyle (4:38.54) to aid the fourth place finish. The third place finish was the Vikings 25th Top 10 finish at state in school history. Lakeside swim coach Tricia Newmyer and state silver medalist diver Sam Witcher. Witcher is the four-time DeKalb County diving champion and holds the county record in diving points. The Lady Vikings had a pair of Top 10 finishes in events to finish with 54 points and 21st overall in the Class 7A team standings. Carlyn Slappey was eighth in the 50 freestyle with a time of 24.25. The 200 freestyle relay team of Slappey, Phoebe Mansker, Isabelle Jones and Paige Meisner took 10th with a time of 1:40.83.